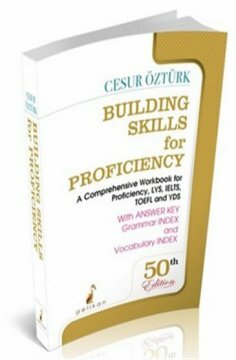 Building Skills for Proficiency is a specially designed workbook containing a wide variety of exercises and tests that aim to help learners to master the English language in order to ensure their success in English proficiency examinations, LYS, IELTS, TOEFL and YDS. The book gives extensive coverage to the complexities of English, providing brief but relevant explanations and carefully selected examples to clarify problems about the structure of the language. In addition, it provides tests to determine how well the learner has mastered a given structure. The book contains about 1500 test items which cover all major grammatical patterns is English. With the addition of important grammar and vocabulary notes and an expanded vocabulary index containing about 3400 entries and 6000 synonyms, the 46th edition of Building Skills for Proficiency is an indispensable reference and test book that facilitates preparation for important English language exams. A detailed key to the tests and exercises is available in the book.